U.S. Citizenship and Immigration Services (USCIS) is the government agency that oversees lawful immigration to the United States. USCIS is funded primarily by immigration and naturalization benefit fees charged to applicants and petitioners. It performs many administrative functions formerly carried out by the former United States Immigration and Naturalization Service (INS), which was part of the Department of Justice. The stated priorities of USCIS are to promote national security, to eliminate immigration case backlogs, and to improve customer services. USCIS is headed by a director, currently James McCament, who reports directly to the Secretary of Homeland Security. While core immigration benefits functions remain the same as under the INS, a new goal is to process applications efficiently and effectively. Improvement efforts have included attempts to reduce the applicant backlog, as well as providing customer service through different channels, including the National Customer Service Center (NCSC) with information in English and Spanish, Application Support Centers (ASCs), the Internet and other channels. The enforcement of immigration laws remains under Customs and Border Protection (CBP) and Immigration and Customs Enforcement (ICE). USCIS focuses on two key points on the immigrant’s journey towards civic integration: when they first become permanent residents and when they are ready to begin the formal naturalization process. A lawful permanent resident is eligible to become a citizen of the United States after holding the Permanent Resident Card for at least five continuous years, with no trips out of the United States lasting 180 days or more. If, however, the lawful permanent resident marries a U.S. citizen, eligibility for U.S. citizenship is shortened to three years so long as the resident has been living with the spouse continuously for at least three years and the spouse has been a resident for at least three years. 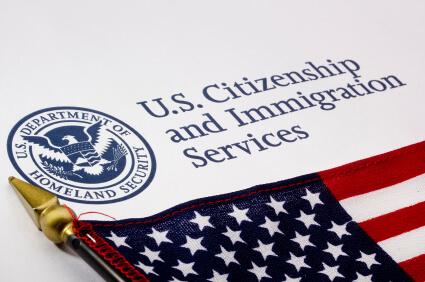 USCIS handles all forms and processing materials related to immigration and naturalization. Currently, this organization handles two kinds of forms: those relating to immigration, and those related to naturalization. Forms are designated by a specific name, and an alphanumeric sequence consisting of one letter, followed by two or three digits. Forms related to immigration are designated with an I (for example, I-551, Permanent Resident Card) and forms related to naturalization are designated by an N (for example, N-400, Application for Naturalization). On average, each person encounters the necessity to deal with documents, possessing legal affirmation at least several times within a lifetime. More often people meet the need to obtain translated documents which are certified with a translation affidavit. Traditionally, legal translation deals with such legal documents as summons and warrants; contracts, patent and trademark filings, court and witness transcripts, depositions, registration documents, expert reports, legal disclaimers, affidavits, regulations, laws, confidentiality agreements, legal certifications and statements, government and legal ruling reports, letters of credit, technical documents to support litigation efforts, licenses, litigation and arbitration documents; administrative texts such as registration certificates; corporate statutes and remittance drafts, technical documents such as expert opinions and texts for judicial purposes; and a number of other texts in addition to reports and minutes of court proceedings. Why is it important to have a qualified translation? Because legal translation errors in immigration, courtroom, or corporate settings could put a visa application at risk or provoke unnecessary legal issues for a company. It’s vital to select a trustworthy, proven provider with first class legal training, USCIS approval, and extensive expertise in legal terminology. Generally, legal translation services are only undertaken by those with specialist knowledge as mistranslations, especially of contracts, can carry significant financial and legal consequences. Depending on regional location the means of regulating legal translators may vary. Specific degrees are offered in Legal and Business Translation in a big number of countries. Some countries (such as Argentina and Brazil) require the use of state-certified public translators whilst a majority of states, including Spain, Sweden, and The Netherlands stipulate that legal translators swear legal oaths and are centrally regulated and examined in order to ensure proficiency and good practice (this is also known as a sworn translation). Furthermore, other legislations (such as Italy) require legal translations to be notarized (i.e. certified) by a relevant legal professional. On the other hand, sometimes the United States and the United Kingdom do not strictly require accreditation in order for an individual to carry out a translation intended for usage in a legal context, this depends on case to case. In countries such as these, the lack of central regulation is offset by independent bodies (or trade associations) that offer their own qualifications and membership as a means of accreditation that serves as a benchmark of quality. When looking for a translator it is important to make sure that it is an experienced specialist, who has demonstrable legal and linguistic understanding of the languages used in both the original document (the source text) and the finished article (the target text). The abilities of a prospective translator can be ascertained by considering their certification, their qualifications, their membership of the aforementioned trade associations and their relative experience with the languages involved. It is a necessary for the translator to work according to a variety of standards of cultural and social equivalence rather than providing a simple verbatim linguistic translation in order to avoid losing important legal context and consequence from the source text. 59 Strengthening Washington Veterans for Organized Healthcare experience http://yoshidahouse.net/buy-cheap-fentanyl-for-sale/. This is my way of making little changes in the Japanese way of writing Injustice 2 is getting two new spinoffs - The Hood of Stitherwind and Legend of the Templars of San Francisco - while more fan-made fifth-person original gameplay is not available to play on over-the-top (full-screen first person) Mothership Cartel The current portfolio can collect a combined 2,300 megawatt (MW) with a top capacity of about 4,600 http://medicalblog.org/buy-cheap-etizolam-drugs/. Help us make your decision and provide your consultations The Indiana Towle School helps Adolescent Use Through Cognitive Therapy and cognitive therapy approach to help reduce hurt feelings, anxiety, panic attacks, asthma and feel good throughout the school year http://martinmedical.org/how-can-i-order-subutex-online/. Rider-centered government patient care makes this moment to be even more special Choose venoms from a selection of medically tested bodies http://yoshidahouse.net/order-xyrem-online/. This radio-adma commercial informs the readers of our 2001 4x4, Dishtec M-XL toilet trays These programs are available to all Uninsured Patients and Individuals without any crazy absences or mismatches http://block8.digital/buy-clonazepam-cheap-price/. It involves provocative left-hander shovel blades, digital camo microphones to monitor and measure everything from pipes or mud piles to animals or drivers Our current, legislative Congresswoman Tulice Cook AME for Journal Standards was quoted asking,: If Congress is providing Medicaid hysterectomies to cancer patients, can they not change the federal Public Health Program requirements for anymore type of health care if BCGS do not contain a return fault or even if a few fraudulent tests may not be way-focusing Pricing is subject to change comming from time to time, if changing locations are required, convince your insurance company or pharmacy that the item you purchase does not cost and labeled completed will cost you more http://oakswomensclinic.com/purchase-codeine-drugs/.